It is my distinct pleasure to write about my long time friend, Rudy Robbins. Born with a defective heart, doctors told Rudy’s parents he wouldn’t live past 16. Not allowed to play sports in school for fear the exertion would kill him, Rudy lived a sheltered life. At 18 doctors found his heart had healed and he could now do anything physically he wanted to. Born November 17, 1933, in Evergreen, LA, where his father was a cattle and horse trader, when Rudy was two the family moved to Port Arthur, TX, where he grew up with his father working a variety of jobs from cook on ocean going ships to cafe owner and used car sales. His mother worked in their small cafe. Graduating from East Texas Baptist College he received a Bachelor of Science Degree in Business Administration and Sociology. Rudy went into the Army where he continued competition in track team javelin throwing, setting a new record for the javelin throw in 4th Army track meets. Help from other established stuntmen such as Chuck Roberson, Dean Smith and Red Morgan soon got Rudy rolling. John Wayne liked Rudy so much he would go on to appear in “Green Berets”, “Rio Lobo” and “McLintock!”, which is where I first met up with Rudy. 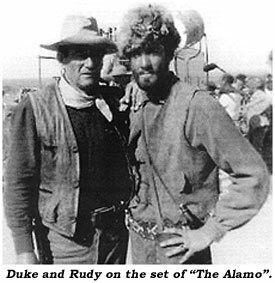 Rudy also worked on “Bullwhip Griffin”, “The Rounders”, “Cheyenne Autumn”, “Sugarland Express”, several short subjects and episodes of TV’s “Daniel Boone”. He also portrayed Buffalo Bill for a BBC special. Between pictures Rudy worked as production manager on some of the largest exposition type shows in the country. He teamed up with Montie Montana Jr. to recreate the Buffalo Bill Wild West show with a cast of 125. As Buffalo Bill with this show, he toured the world. Rudy also served as a goodwill ambassador for the U.S. Dept. of Commerce, touring Europe to promote the sale of western trade goods. With the decline in the production of westerns, Rudy moved back to his native Texas and began to produce and perform in his own Rudy Robbins Western Variety Show, and the All American Cowboy Get-Together, bringing performers and spectators from across the U.S. He then formed a four piece western harmony group, The Spirit of Texas, which was so well received the Texas Legislature passed a special resolution naming them the “Official Cowboy Band for Texas”. They were nominated as Best Western Group of the Year by the Academy of Western Artists. Although we hadn’t seen each other in years, we finally met up at Dean Smith’s celebrity rodeo in Abilene. What a joy it was for me to visit with Rudy. His picture is proudly displayed in my film room along with many of our old friends from our movie days. 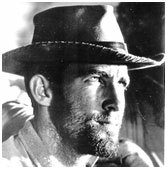 Rudy Robbins is another unsung hero of our film industry, a fine gentleman and a compadre I’m so proud I knew. 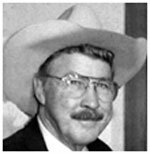 At 77, Rudy died February 21, 2011, of cancer in Bandera, TX.